CLEMSON, S.C. — To his right, there are nap rooms, an arcade and a barbershop. Above him, one of a seemingly infinite number of flat screens. Below his feet, which are encased in sandals the size of milk cartons, bright purple carpeting. Here in pigskin Disneyland—Clemson's new $55 million, 142,500-square-foot football operations center—the distractions are boundless. And yet amid all the shine and glam and state-of-the-art football tech, nothing commands your attention quite like Dexter Lawrence. Even in a place this big, Lawrence seems impossibly large. Even in a place so accustomed to seeing athletically gifted football players patrol its magnificent hallways, Lawrence seems impossibly so. Wearing a long-sleeved white shirt with an orange Clemson paw print, he saunters his 6'4", 340-pound body through Clemson's cafeteria. Although he shares the facilities with future NFL draft picks—unique talents with special builds and abilities—there is no one like him in this building. Or most buildings, for that matter. Despite his listed size, he carries no apparent extra weight. Lawrence has gotten his body fat down to 18 percent since arriving here, doing so as one of the largest players in the sport. And while he won't be eligible for the NFL for at least one more year, nearing the end of his sophomore season, those within the league have already taken notice. "He has the tools to be the next Suh," one NFL scout says. "First-overall talent. Good luck not watching 90." An ankle injury has plagued Lawrence for much of this season, forcing him to miss multiple games and play less than 100 percent throughout. Despite the small sample size of production, many have seen all they need to see. The league is already in love. Dabo Swinney isn't wearing socks. He settles into a bright orange chair inside his office, which is the size of a respectable condominium. The sun shines radiantly on the practice fields, visible from the window closest to his desk. Work attire for the day, a Wednesday in late August, is faded blue jeans and a white golf shirt with blue and red stripes. Pictures and jerseys and trophies and other mementos hang from the walls—the result of years of triumphs that are growing in significance and frequency. This isn't just his work area; it's a trophy chamber designed to appeal to elite high school football players who may happen to enter Swinney's office on a visit. Before this office existed, before he had a national title to stand on, Swinney had to sell Lawrence on joining the program. He coveted the defensive tackle, Scout.com's No. 2-ranked player in the class of 2016, the moment he met him at Wake Forest High School in North Carolina. During his first visit to Clemson, however, Lawrence, his mother and his stepfather were involved in a car accident as they left campus. While no one in the car was seriously injured, the incident was jarring enough to give Julia Parker, Lawrence's mother, pause about Dexter committing to Clemson. "You will not be going to this school," Parker told her son. "I just wasn't feeling it at all." Two years later, after looking at Alabama and Florida and NC State, Lawrence returned to Clemson with his mother. This time around, the comfort of the environment won them both over. The educational aspect and the way Clemson has sold this as a priority appealed to him as well. "I'm trying to be an Academic All-American," Lawrence says. "That's one of my goals." He arrived at Clemson weighing in at nearly 360 pounds. While the coaching staff assumed he had to be out of shape based on this number, its perspective shifted as soon as practice began. "I've never seen a guy this size who moves like this," Swinney says of Lawrence. "I've been around some big guys, but I've never been around a guy that big who is that athletic. He's just a huge, strong man. I mean, he was stronger than some of our seniors as a true freshman showing up." He flashed throughout the spring and fall camp. Then, in the team's very first game against Auburn, he flashed again—validating what the coaches saw over the previous months. He was regularly in the Auburn backfield, disrupting the team's offense. He also logged his first sack in a 19-13 win. 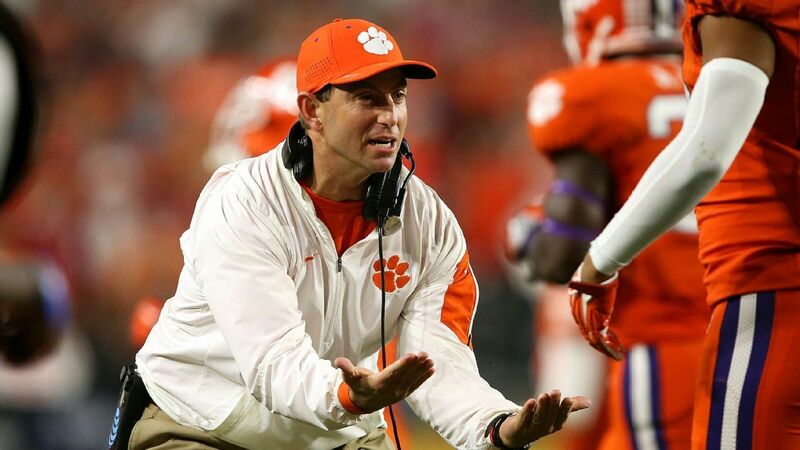 "When I watched the Auburn tape," Swinney adds, "I kept saying to myself, 'This is a true freshman?' This was his first college game, and he's as good as we got." Given his profile as a recruit, it didn't take long for his reputation to grow as a 19-year-old true freshman. Even alongside future NFL players, he was often the most disruptive on the field to opposing offenses. He finished the season with seven sacks and nine-and-a-half tackles for loss—tormenting quarterbacks from his very first game to the national championship against Alabama. He was named ACC Defensive Rookie of the Year. While gaudy sack and tackle numbers can often headline the evaluation of a player, what Lawrence does is something that will never be celebrated through numbers. Because of the space he commands, a considerable part of Lawrence's value lies in the reality that his presence will undoubtedly make the game easier for his teammates. The fact that he eats up space so instinctively is what separates him from just about any defensive tackle in the country. His ability to create on top of it, through double-teams and added attention, is why so many are so excited. "There is no limit to Dexter," Swinney says. "He can be as good as anybody who has come through here. He's just a rare guy. He doesn't have a weakness." This is perhaps one of the few times in Christian Wilkins' life when anyone could perceive him as small in stature. At 6'4" and 300 pounds, Clemson's junior defensive tackle has blossomed into a magnificent defensive player—possibly the best draft-eligible lineman in his class. Wilkins, who will earn his degree in December, was honored with the seniors on Clemson's Senior Day. If he indeed decides to leave for the NFL, he will likely not have to wait long to hear his name called. By any reasonable form of measurement—and even by unreasonable NFL standards—Wilkins is massive. And yet, as he takes his seat in Clemson's cafeteria, situated just a few feet away from Lawrence, the difference between the two is striking. "He's the guy with power, and I'm a bit more finesse," Wilkins says of his teammate. "He's 345 pounds and strong as an ox. He just moves people out the way. I'm pretty strong, but not quite that strong." Wilkins took Lawrence under his wing the moment he arrived. There they were, after Lawrence's first practice last spring, hitting the tackling sled together in the darkness after the field had emptied. From his technique to the way he deals with the media, Wilkins' voice has been the constant. The two don't just compete on the field—where often they're shoulder to shoulder, a horrifying sight for an opposing offensive line—they also compete in the classroom, trying to outperform each other in terms of grades and GPA. They'll even compete when it comes to nutrition, sharing body compositions with one another, which Clemson tests regularly. "We make each other better each and every day, on and off the field," Wilkins says. "We're fortunate to have talent, but we both want to be the best at what we do." Clemson's a tough place to do that right now if you're a defensive lineman. Bleacher Report draft expert Matt Miller ranks Wilkins as the top defensive tackle (and 17th overall) among players eligible for the 2018 draft, while redshirt sophomore Clelin Ferrell ranks as his third-best edge-rusher (and 16th overall) and junior Austin Bryant is fifth in that category. All will be NFL draft picks. But as talented as those players will be—and as much as Clemson has to offer on the other side of the ball in players such as wideout Deon Cain and offensive lineman Mitch Hyatt facing a similar decision—the player scouts can't take their eyes off is Lawrence. He's the one they covet most. "What I've heard over and over again is that when scouts go into Clemson, they ask about Cain, Hyatt, Wilkins and Ferrell, but the one guy they all want is Lawrence," Miller says. "The coaches say he's a rare player and person, and scouts are eating it up. He'll be my No. 1 player for next year's draft barring some kind of injury." The personality and the appearance don't necessarily align, which is unquestionably part of his allure. Beneath all the mass that Lawrence carries so naturally is a soft-spoken, expletive-free soul who has a deep love of math. "He doesn't see himself as this giant of a man," Swinney says. "His persona does not fit his body." His love of numbers morphed into a love of forensics the moment calculus came into the picture. The countless hours watching the television series CSI grew into a potential career path. "I like learning about the body," Lawrence says. "It's just something that interests me." The end game isn't a long, lucrative life in the NFL. He sees beyond that. Lawrence, who majors in justice studies, could ultimately see himself in the FBI. There is indeed something different about a man drawing comparisons to one of the sport's most violent, volatile players. "Mr. Suh," Lawrence says when asked about a player he's modeled his game after. "It's how aggressive and how strong he is after every play. He's the bully, and he goes and gets it." Personalities aside, the comparison is almost too obvious to make. Few players at any level have ever carried this kind of weight with such agility. And while scouts undoubtedly see this parallel, Lawrence's head coach likens his star defensive tackle to someone completely different—a player who will be celebrated by Clemson fans for as long as they live. "He's a Deshaun Watson at his position," Swinney says. "Yes, he's a great player, but what a young man. It is here that ability and personality partner, which is what makes Lawrence so appealing. Although he has spent much of the year trying to get healthy, his body has not always cooperated. He returned to play in last weekend's win over South Carolina after missing two games, but it is possible we won't see a completely healthy version until next fall, when Lawrence will begin his junior season as one of the most desirable NFL draft prospects and likely the face of Clemson football. That his draft buzz has only blossomed during this time says all that needs to be said. A 340-pound man with 18 percent body fat and a love of math doesn't surface too often. Scouts and coaches and general managers know they won't get their hands on him for a while, but they also already know he'll be worth the wait. Adam Kramer covers the NFL for Bleacher Report. Follow him on Twitter: @KegsnEggs.